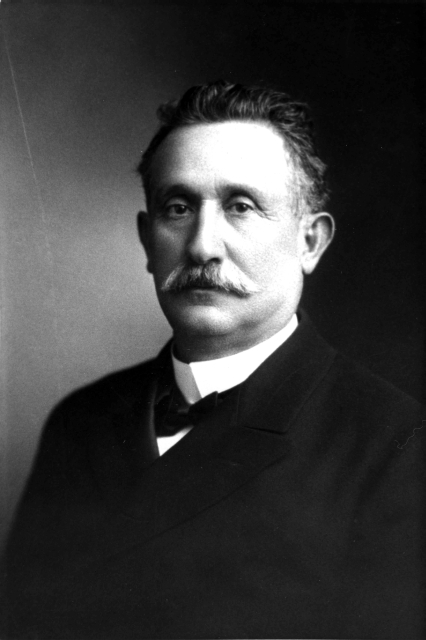 Kaspare Cohn was born in Loebau, Prussia, in 1839. 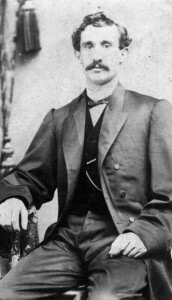 At the invitation of his cousin, Harris Newmark, Cohn arrived in the United States and headed to Los Angeles where he arrived in 1859, at the age of 20. 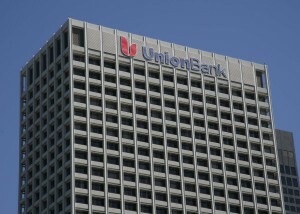 In Los Angeles he immediately went to work in Harris Newmark’s store, sleeping on the premises. In 1864, Kaspare Cohn left the employment of his uncle and went north to Red Bluff, California, where he opened a crockery store. He returned to Los Angeles in 1866. In Los Angeles, he entered into a partnership with Harris Newmark and his brother Samuel Cohn, establishing a grocery and dry goods wholesale-retail business which prospered. In 1879, H. Newmark & Company was dissolved. A new partnership of Harris Newmark, Kaspare Cohn, and Morris A. Newmark thrived. Another firm was created, K. Cohn & Company, specializing in the collection and shipping of hides and wool. In 1896, Kaspare Cohn was involved in the creation of the Pacific Wool Company, which processed wool in “the most modern of ways.” Previously, all raw wool had to be shipped to San Francisco. Like many pioneer merchants, Kaspare Cohn invested in real estate. In 1887, records indicate he held $440 worth of real estate. In 1894 his property holdings were valued at $44, 530! In 1899 Harris Newmark and Kaspare Cohn owned and developed what is now known as the City of Montebello. They also invested $85,000 in the Santa Anita Ranch. Two years later, they sold the ranch to “Lucky” Baldwin for $200,000 – in cash! Kaspare Cohn dealt with Basques who raised sheep north of Los Angeles. Many of them would deposit their money with Cohn, creating an unofficial bank. 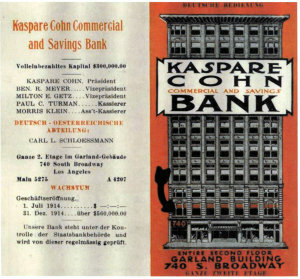 Kaspare Cohn Commercial & Savings Bank was officially incorporated in 1914. 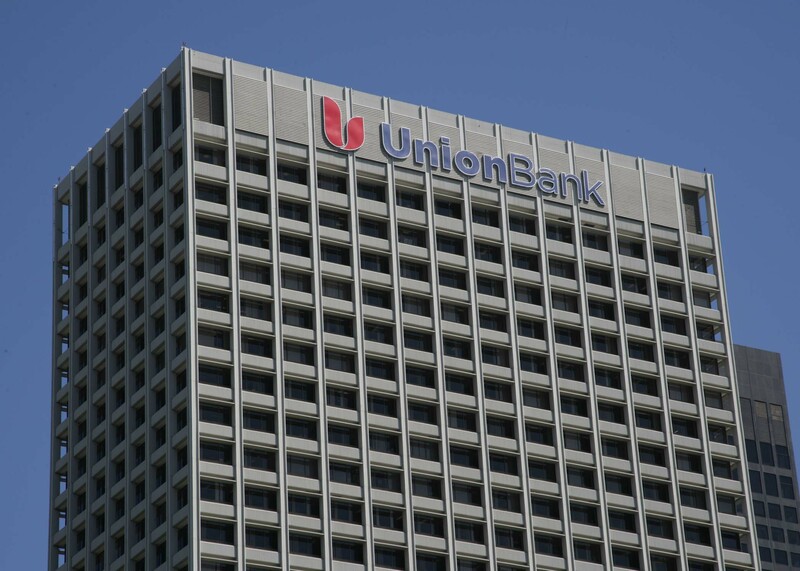 After Cohn’s death in 1916 his two sons changed the name of the bank to the Union Bank & Trust Company. Kaspare Cohn was very interested in Hydro-electric plants and natural gas. He held interest in the San Gabriel Light & Power Company, the Southern California Gas Company, the Midway Gas Co., and more. In 1889, Cohn was listed as a Director of the Lowe Gas & Electric Company of Los Angeles. 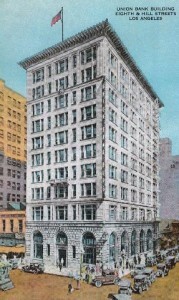 The Pacific Light & Power Company, incorporated in 1902, included Cohn as a Director. 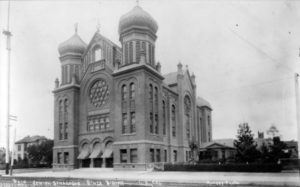 When Congregation B’nai B’rith (now Wilshire Boulevard Temple) dedicated its second building at a cornerstone laying in 1896, Cohn and others contributed the stained glass windows. In 1902, Cohn led the movement to create a new Jewish cemetery in a “better” location. He purchased and donated 30 acres of land in East Los Angeles on Whittier Boulevard. Arrangements were made to transfer all remains and monuments from the old cemetery in Chavez Ravine to the current cemetery site in East Los Angeles, now called Home of Peace. He was also “Special Counselor” to the Ladies Hebrew Benevolent Society. 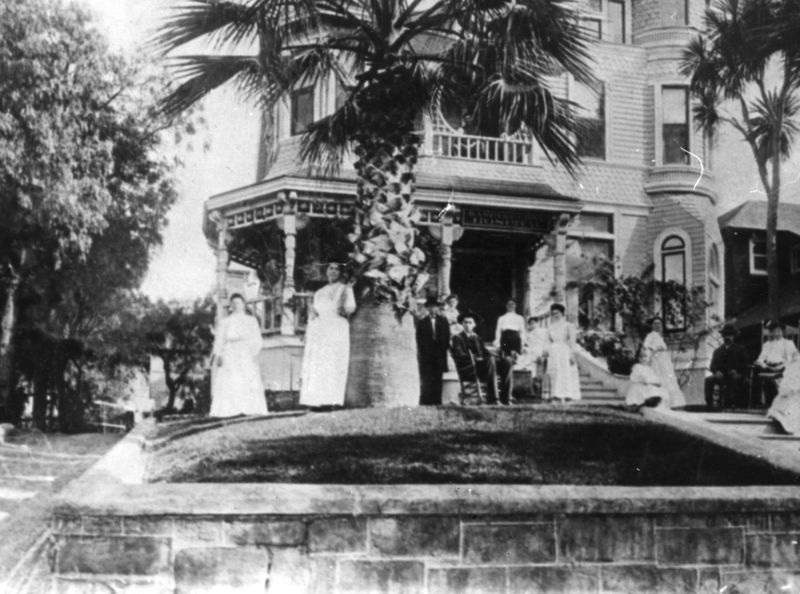 Mr. and Mrs. Cohn were part of the Organizing Committee for the California Jewish Orphans Home, which has evolved into Vista del Mar. In 1869, he helped in the formation of the Los Angeles Social Club and the California Club. In 1902, Cohn purchased and offered a two story house at 1443 Carroll Street to be converted into a hospital. The Kaspare Cohn Hospital was dedicated that same year. In its earliest years, it was a Consumptive Hospital for Tuberculosis, run by the Jewish Consumptive Relief Organization. 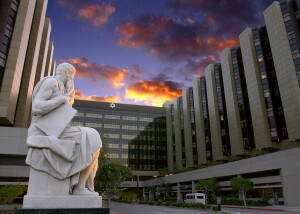 However, the City of Los Angeles decided to remove all tubercular facilities from within the Los Angeles City Limits. The Jewish Consumptive Relief Organization purchased 10 acres in Duarte, sixteen miles to the east, which eventually became the City of Hope. The Kaspare Cohn Hospital reverted to a general “Jewish” hospital. In 1910, the hospital relocated to a new brick building on Whittier Boulevard near Boyle Heights. At the annual meeting of 1913, Cohn presented his check for $5,300 that wiped out all the debts of the hospital. 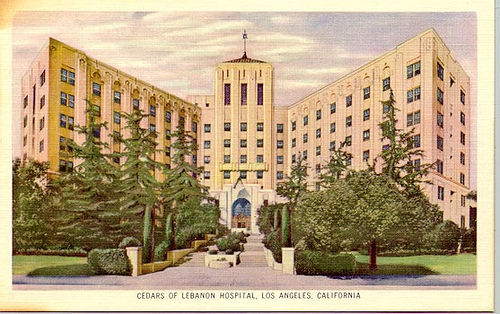 When the hospital moved to its third location, an even larger building at 4833 Fountain Avenue, the family requested that its name be changed to Cedars of Lebanon Hospital. 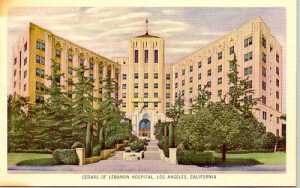 Today Cedars of Lebanon and the earlier Sinai Hospital make up the world-renowned Cedar-Sinai Medial Center. Kaspare Cohn married Hulda Newmark in 1872. She was the daughter of Joseph P. Newmark, brother of Harris Newmark. 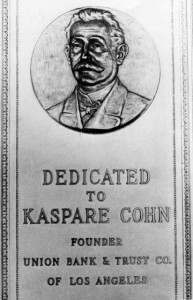 Kaspare Cohn died in 1916. He was survived by his wife and their two daughters: Mrs. Ben Meyer and Mrs. Milton E. Getz. William M. Kramer, “Kaspare Cohn: A Man Who Helped Make Southern California, Part 1,” Western States Jewish History 23/3. Western States Jewish History 23/4. Norton B. Stern, “Kaspare Cohn: Notes from a Session with Edwin J. Loeb,” Western States Jewish History 41/3. Norton B. Stern, “Groundbreaking for the Kaspare Cohn Hospital “Cedars of Lebanon,” Los Angeles, 1929,” Western States Jewish History 41/3. William M. Kramer, “Kaspare Cohn: A Tribute; Kramer,” Western States Jewish History 23/4.